The first budget set out by a new government is usually where the excitement happens. It sets the bold vision for what to expect over an exciting four years of the new government. The second budget is normally the home for the tough decisions and usually drills down into some of the visions outlined in budget one, before the third and fourth build towards getting re-elected. This budget didn’t really live up to that typical billing, especially when it came to infrastructure. The tough calls were notably absent, and it was light on some of the expected detail. The most keenly anticipated announcements revolved around the proposed Infrastructure Bank and possibly some indication of which infrastructure assets could be leveraged to fund the bank. Details on both were limited. There were some additional details on where the promised $180 billion investment will be spent, but again it was not as enlightening as many had expected. If one group would have been frustrated with the 2017 budget it was Canada’s manufacturers of oversized scissors. $13.6 billion was budgeted for the first phase in the first year, only a third of the money got out of the door according to the Parliamentary Budget Office. The good news is that unspent infrastructure money will carry over, taking away the use-it-or lose it mentality which did not promote good project decision-making. But the government is under growing pressure to start getting the money out of the door. In the federal government’s defence, they had been decimated in the 2011 federal election with only 34 MPs elected. With the surge of support that came in 2015, a lot of new MPs had to subsequently get up to speed. The second factor is the federal government relies on good project submissions from provinces and municipalities, if they don’t come the money can’t be allocated. Throughout the election campaign the Prime Minister repeated his mantra that it would be up to provinces and municipalities to decide where and how the money would be best spent. In theory this is a great approach, the challenge is capacity and expertise – and local politics. At the same time, the federal government can take steps to simplify the process of submitting projects to move things along. One way could be to develop a joint federal-provincial application, evaluation and approval process for municipalities. This is something we tried in Ontario with our federal counterparts around a rural municipality infrastructure fund. By providing one single two-page application with a clear scoring system that projects would be judged against by officials we helped accelerate the process. This is the type of seemingly small step that can make a big difference in getting projects ready to go more quickly. The budget provided little information on the future role and shape of the proposed Infrastructure Bank, but Finance Minister Bill Morneau promised a legislation would follow soon. 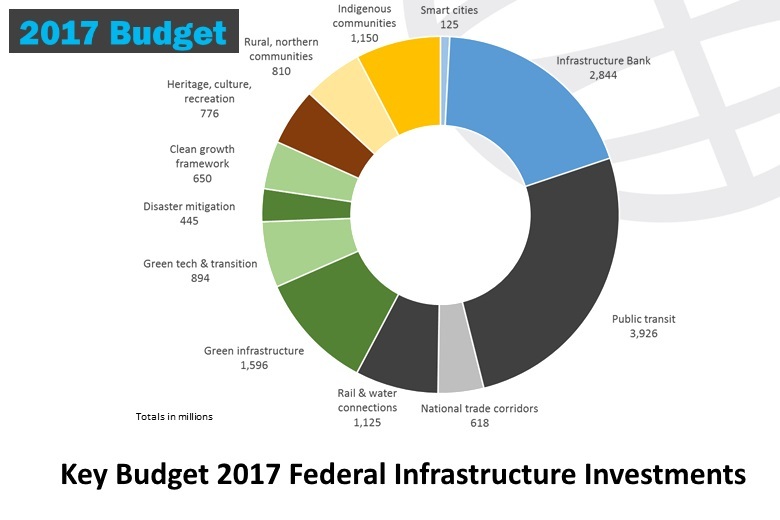 The Infrastructure Bank has been handed a war chest of $35 billion to help unlock around $140 billion of private funding looking for a good return. Using a combination of loans, loan guarantees, and equity investments it will prioritise revenue generating projects like transit and transportation, and electricity interconnections. Some further clues were given on the destination of the bank’s money with $5 billion set aside for green infrastructure projects, has promised at least $5 billion for public transit, and a further $5 billion for trade enabling infrastructure. A further $20 billion will be available through equity or debt. With one of the main roles of the Infrastructure Bank being to monetize federally owned revenue-generating assets (like airports and ports) there were no clues on which assets could come on the market. It was interesting though that ViaRail received $800 million over three years for operations and capital investment with big plans to improve the rail service between Toronto and Montreal – a project which could fit well with the bank’s mandate. From earlier comments, it appears the Infrastructure Bank will have a fairly broad role. One focus is to develop a data-driven approach to decision-making and measure performance of assets. Canada is not the first country to try to find a way to get private capital to invest in greenfield infrastructure. The UK developed the Pensions Infrastructure Platform with a goal of raising up to £20 billion to build new transport and energy projects. It only raised £1 billion. 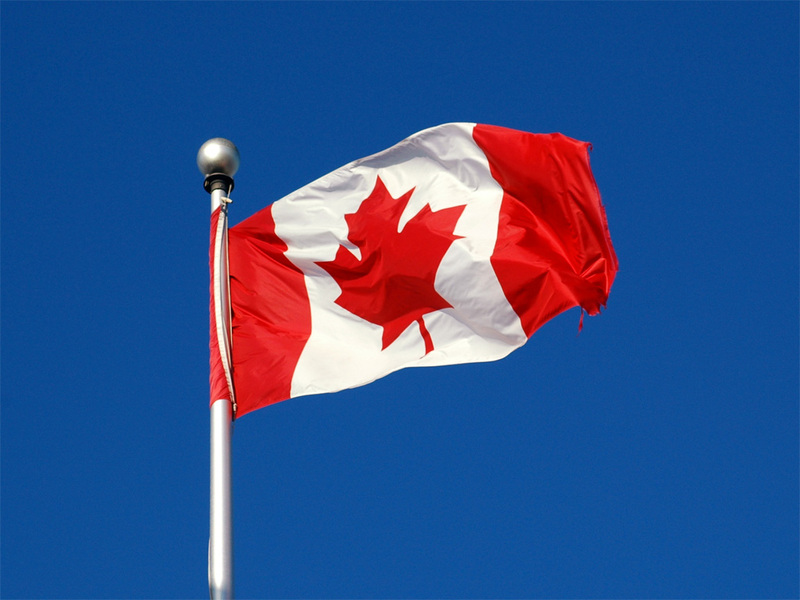 The risks around infrastructure have put off investors to date, but if Canada can promote some innovative approaches that could improve the delivery of projects, infrastructure could start to become more attractive as an investment proposition. The details of how money will be spent were a true reflection of the Liberal election campaign. Climate change, innovation, and helping the middle class were notable policy goals infused throughout many of the funding announcements in infrastructure. On top of straight funding announcements, and policy levers, some innovative approaches are on the table too. The Smart Cities Challenge Fund invites cities across Canada to develop plans together with local groups, businesses, government and civil society with $300 million over 11 years. Based on a US idea, it will get cities thinking out of the box of how to solve their issues differently. To help achieve national climate change commitments to reduce emissions by 40% by 2030, $21.9 billion has been promised for green infrastructure. The funding will be spread across many programs, investing in smart grids, emerging renewable technologies, helping remote communities get off diesel, promoting electric charging points, and developing new building codes. Here there are also a number of policy measures like pricing carbon, and setting clean fuel standards, in addition to the money. Again reflecting their campaign speak, the infrastructure commitment gives a heavy emphasis to how these investments will make lives better for the middle class. The government has promised $20.1 billion over 11 years through bilateral agreements for transit, on top of the $5 billion from the Infrastructure Bank. Under pressure from the big cities they have also committed $11.2 billion in total over 11 years to build, renew and repair affordable housing. There could be some opportunities for innovative approaches in this area given the state of the current housing stock and the shortage of affordable housing. A favourite statistic of politicians keen to push projects is that every dollar spent on infrastructure delivers $1.6 dollars in benefits. If they are well designed and planned, that can be true. It can be emphatically true and value from such investments can be huge if the project is right. Think of the value that London has got from its decision to build its underground system over 150 years ago. At the same time there is an impressive collection of infrastructure white elephants around the world which were badly conceived, and even more badly delivered, to act as a constant reminder of the need to do things properly. My favourite statistic is that good quality engineering and risk analysis undertaken before construction can cut project costs by a fifth. The aim for building each project should be to have shovels in the ground for the shortest possible amount of time, the longer they are in, the greater a project will cost. The government is right to take its time to get things right. But just don’t take forever. Interested in Partnering with the Infrastructure Lab? If you have a challenge that you would like to tackle, or an idea you would like to explore, we are keen to hear from you. The Infrastructure Lab works with companies and associations to develop research themes and programs that can deliver different approaches that benefit all.